How to migrate to WRAPPED adapter? 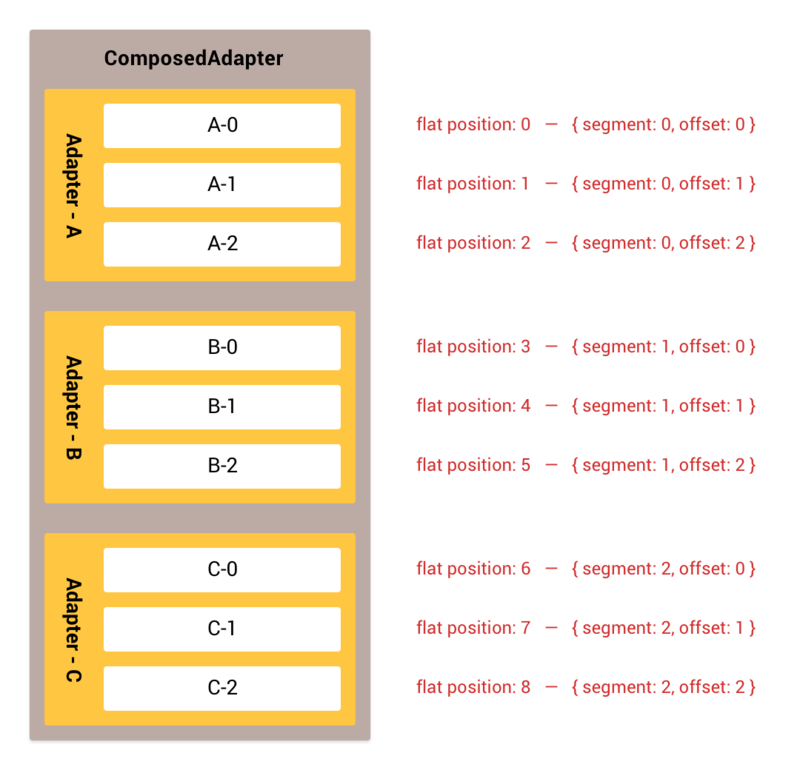 The ComposedAdapter is an adapter which aggregates multiple adapters into one. The ComposedAdapter calls each child adapters as segment, also child adapter's local item position are called as offset. When merging adapters, we must take care about item IDs. They have to be unique in entire the dataset, but the problem is child datasets may contains the duplicated IDs. The ItemIdComposer is used to manage this problem. This utility class provides several static methods to handle the packed item ID value. Item IDs are expressed by 64 bits length integer in RecyclerView, so it can be embed multiple information by using bit operation technique. ItemIdComposer divides 64 bits into four chunks; view type segment, group ID, child ID and reserved bit. Item view type has similar problem like item ID. The ItemViewTypeCompser manages packed item view type value that ItemIdComposer doing it for item ID. Item view types are expressed by 32 bits integer in RecyclerView, and ItemViewTypeCompser divides it into three chunks; expandable group flag, view type segment and wrapped view type code. Need to change several things to use your adapter wrapped with ComposedAdapter. Refer to the Tweak your Adapter to support adapter wrapping page for more details.